Before I talk to you about Queenie Hennessy, I am going to talk a little bit about Harold Fry. I love Harold Fry, and I loved The Unlikely Pilgrimage of Harold Fry. I read this book shortly before starting my blog, so I don’t have a review of it, but it did make my Top 10 list for 2013. I think one of the reasons I loved Harold Fry was because of his pilgrimage. I love a good walk, and I love the idea of walking a long way, going through small towns, meeting quirky people. For the same reasons, I have also loved Wild by Cheryl Strayed, A Walk in the Woods by Bill Bryson, Cold Mountain by Charles Frazier, The Incredible Journey by Sheila Burnford (even though they were pets), I Am David by Ann Holm, The Lord of the Rings, The Memory of Running by Ron McLarty (even though this was mostly by bike, I think), The Outlander by Gil Adamson, and Flanagan’s Run (and this was running) by Tom McNab. Just to name a few. Some people are saying that they like The Love Song of Miss Queenie Hennessy even better than The Unlikely Pilgrimage of Harold Fry. I can’t say this for sure, because it feels like too long ago that I read about Harold. But I can say that Queenie is just as good, if not better. I loved The Love Song of Miss Queenie Hennessy. We were a tall, married man who was kind and a short, single woman who loved him. I read Queenie over the Thanksgiving weekend, and it was the perfect time to read it. It made me think about it in a different light. Is Queenie thankful for the life she has led, or does she regret her silence? What should she have done? What would I have done? We can’t change the past, and there is no sense in worrying about the future. In the present, Queenie is living at the hospice, waiting to die. She has sent her letter to Harold to say good-bye, thinking that was the end of it. But, then she hears from Harold that he is making a journey across country by foot to see her. She is to wait for him. Queenie: I can’t wait for Harold. I am here to die. Sister Mary: Pardon me, but you are here to live until you die. There is a significant difference. Queenie becomes anxious thinking about Harold coming to see her. She thinks of everything that happened in the past that drove her away from him to live out the last twenty years of her life in solitude. Things that he doesn’t know about. She also thinks about how she looks now – very different than before. To help set her mind at ease while she waits, Sister Mary Inconnue encourages her to write a new letter to Harold explaining everything to him, leaving nothing out. So, she does. Sometimes, Harold, the way forward takes you by surprise. You try to force something in the familiar direction and discover that what it needs is to move in a different dimension. The way forward is not forward, but off to one side, in a place you have not noticed before. As she writes this letter, though, she experiences a journey of her own. As she revisits the past, she also becomes more involved in life at the hospice and realizes that she has friends there who are fun and kind and quirky. There is still beauty in her life; her happy memories, her friends at the hospice, the kindness of the nuns who are taking care of her, the thought of Harold Fry coming to see her. Will she be ready for Harold’s visit? What will he think of her after reading her new letter? People think you have to walk to go on a journey. But you don’t, you see. You can lie in bed and make a journey too. Queenie’s story is lovely, told in a light tone with a lot of humour. And you will need tissue, especially at the end. But how will you feel after reading the ending? I haven’t fully figured that out yet. Has it left me feeling happy and satisfied? Sad and frustrated? Relieved? Maybe all of the above. Read it and see. You won’t be sorry. *This book was kindly sent to me by the publisher. Harold Fry has been on my TBR pile for quite some time, and The Love Song sounds very tempting. Would you recommend reading Harold’s story before Queenie’s story? Yes, I think so. Queenie can definitely be read alone, but I think you would enjoy it more if you read Harold first. Loved Harold Fry too. Can hardly wait to try this companion novel. Thanks for the review. Good! Another Harold fan! I think you will like Queenie, too. I am in the middle of this one right now! I enjoyed Harold Fry, not so much because of the idea of walking, but because his walk took him on a journey out of alife that had stagnated. It gave him a purpose for the first time in a long time. I think I’m already enjoying Queenie more. I’m not sure why – maybe because hers is a female voice that I just automatically relate to more? I liked that aspect of Harold Fry, too. It’s never too late to re-start your life. I don’t know what it is about Queenie. I think I really like that there is more than one story going on at once in the book. There’s her story about Harold, her story about herself, and the present day story going on at the hospice. And, the ending. Let me know what you think about that! 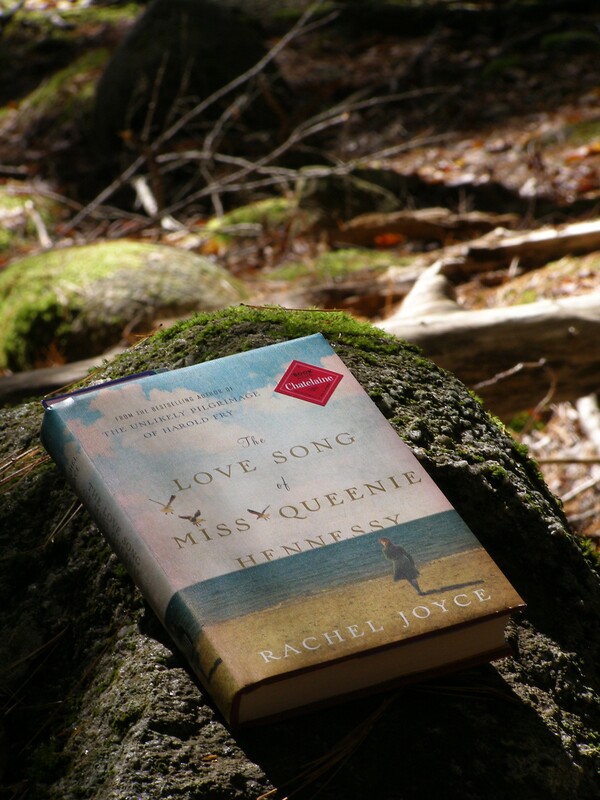 I downloaded The Love Song of Miss Queenie Hennessy by Rachel Joyce. Can’t wait to start reading tomorrow!! This sounds so wonderful, as do your whole post in general and your list of great “walking,” meditative books. Maybe it’s because of my stage in life but characters who are forced to reflect on their lives are now very appealing to me. I will look this one up as well the other books on your list here! I like the fact that Queenie is reflecting back on her life, too. It makes me wonder what I would have done in her place, and how it might have changed anything. And, it always reminds me to pay more attention. Another thing I like about the ‘walking’ books is that usually there is some sort of life-sorting-out or reflecting for the character. Queenie is one I think you would like, for sure. Lovely review, Naomi! 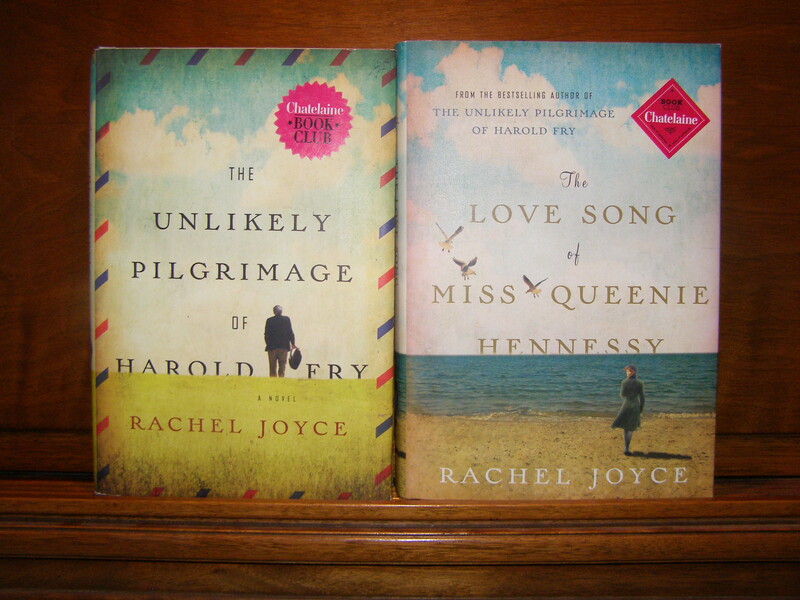 I haven’t read Harold Fry but I am over half way done with The Love Song of Miss Queenie Hennessy. I’m glad to hear you loved both! I’m really enjoying the book. I think anyone who has ever had an unrequited love and/or someone who got away will relate to this book. The questions “What should she have done?” “What would I have done?” are really interesting… I guess I’ll have to keep reading to see how I feel about those. What a lovely review (and I love your picture)! I’ve read about 100 pages of this book… I had to interrupt it to read the Giller books, but I can’t wait to get back to it, especially after hearing how much you loved it! I love the fact that you are reading all the Giller books. I always want to do it, but have never done it. Someday! I’m looking forward to reading what you have to say about them all! When you’re done, The Love Song of Miss QH will be a nice reward. Oh, I can’t wait to read this! I guess I will just go ahead and order it, darn it. You have me so curious. I don’t think you’ll be sorry if you end up buying this one. It’s hard to imagine someone not liking it.